Do you want to feel the presence of spirit in your life? Do you sense something’s wrong, but you can’t quite articulate it? Would you like your feelings to shift without having to talk about them? Do you want to connect to nature in a deeper way? We are all connected by a common origin, the big bang. Our bodies are the evolutionary inheritance of all that has ever been. Our genes carry traces of that immensity. We have access to the power that created us, as our birthright. Shamans know how to harness the forces of nature, to release us from our limited selves, to heal, to realign us with who we really are. Everything is a gateway to spirit. Just to mention a few possibilities, healing can happen through prayer, stones, songs, fragrance, rattles, feathers, and intention. When we know nature is our friend and ally, we more easily flow with the earth’s changes. We are carried safely when we regain our trust in a higher wisdom than our own. 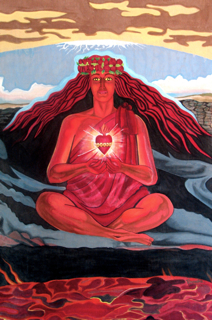 I completed a two-year training with the Power Path School of Shamanism. They endorse me as an advanced practitioner. I’ve travelled several times to the Amazon jungle and central Mexico to take part in healing traditions of the Shipibo Indians of Peru and the Huichols of Mexico. Shamanic services available include retreats, healing clinics, individual healing sessions, rites of passage such as weddings, baptisms, and memorial services. Healing sessions are available, and equally effective, in person, by phone or Skype. 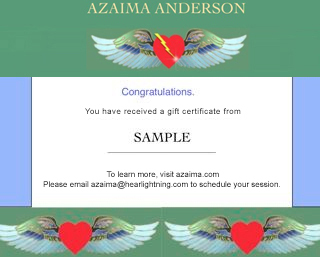 If you are purchasing a shamanic healing for someone else, please contact me at azaima@heartlightning.com to let me know the email address of the recipient of the gift certificate.